Ye Olde Record Shoppe's First Sale @ eBay	that Bruce and I made, was pretty cool. It amazed both of us. Although it was an LP and we had no idea what anyone would bid for it, we had to give it a shot. 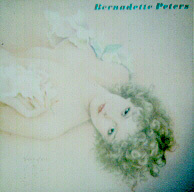 The lucky item was a mint condition LP by Bernedette Peters, with her layed out as a Vargas girl. We asked $4.00 as an opening bid, and received $20.00 by the end of the auction.
. Vinyl @ eBay .